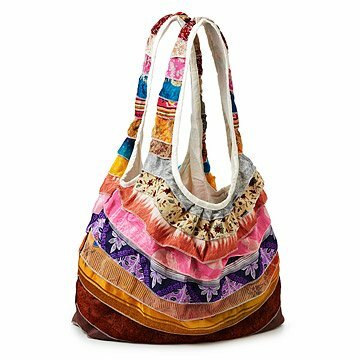 This over-the-shoulder purse is covered with colorful ruffles, made from reclaimed saris. When you leave behind something important, it may leave you feeling ruffled for the whole day. But carry this ruffled shoulder bag with you, and you'll have the perfect accessory for keeping track of everything you need, and look brilliant while doing it. The one-of-a-kind bags are handmade by craftspeople in India from recycled saris. For each one, the layers of silk and rayon come in a unique combination of colors and patterns, ranging from jewel tones to earth tones. The bag has an inner lining of lightweight white cotton with a large central compartment and a single side pocket for quick access to your keys, purse or wallet. The clasp functions in two ways: there's a button and loop fastener, and a fabric cord that can tie the bag closed for greater security. Handmade in India. Due to the handmade and upcycled nature of these items, each bag will vary. We cannot guarantee all colors in photo will be incorporated into each bag. I was pleasantly surprised when the handbag arrived -- loved the colors, the style, the construction. My niece works for a nonprofit, and this reflected her personality and and her free spirit. Yes, this is the second one I have ordered. I purchased this item a few years ago for a friend and she loved it. Knowing she was planning a trip to Holland, I thought she might like a new one. She was thrilled to receive it and loved the colors. Its too big and although I knew that it was basically an "open " top I was hoping for a better closure. So it won't be used as a purse...too easy for things to spill out. Very pretty and colorful. Nice quality. I gave it as a gift, so I can't speak to its everyday use, but I know it looked good! I am using a small cosmetics bag inside which I would recommend. She really likes the bag. Is using it everyday. Fits any occasion for day. Not dressy enough for night except when just hanging out. A very fun and cute purse.